I feel secure in my prediction that I will never move to Lubbock. A stroll through the aisles of the local Sprouts market reinforced the grim impression I had of the place when I drove into town. 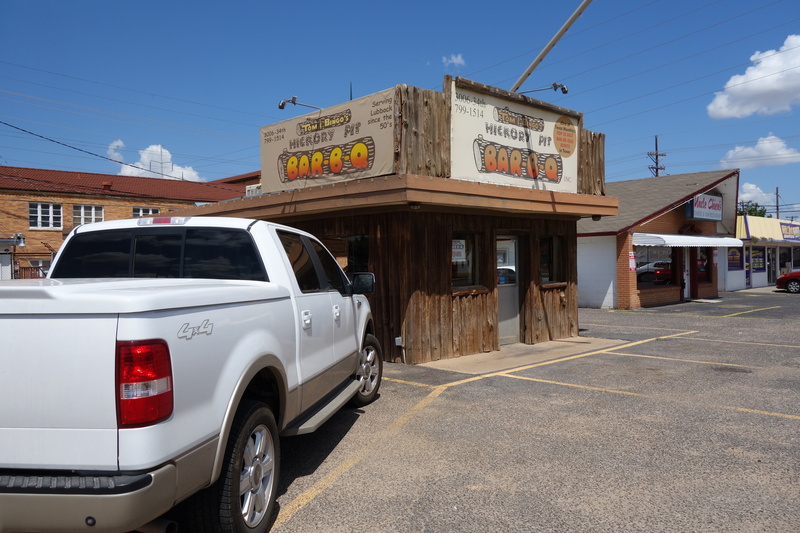 However, I could not resist one last stop at a BBQ place, Tom & Bingo’s Hickory Pit BBQ (call me conflicted). At 3 o’clock in the afternoon, the two youngsters who owned the place were slicing up the last of the day’s brisket. I asked for just a few slices. “Well,” Bingo said, looking at her husband, “normally we don’t sell it that way, but we’re closing soon.” So they wrapped some slices in foil and I carried back to my desolate motel. It was pretty good. Juicy, good flavor, not as good as Franklin’s, but I’m prepared to believe they’re the best in town. Once I’m back in Arizona, where I will be among family and friends who eat well and healthily, I will breathe a sigh of relief. I’ll be almost home. Tomorrow, back to Las Cruces, New Mexico. Now there, I may finally get to try some Hatch chilies.